The chaps at KAIJU! Beer and Exit Brewing have always got on well, so well in fact that they moved in together, with the latter becoming house guests at the former's new brewery in Dandenong South. Last year, they consummated their relationship with Schopsh, a beer that took a beer style Exit love, a smoky Scotch Ale, and added lots of the hops with which KAIJU! are synonymous. It's not the most common of combinations; indeed, we recall a conversation with former Temple Brewing man Ron Feruglio in which we were discussing popular entries in The People's Pint competition, when he stated that smoke and hops do not mix. Yet, these days, anything goes. Or should that be "anything goesh"? CertaInly, Schopsh I found favour and encouraged the brewers to do it again. 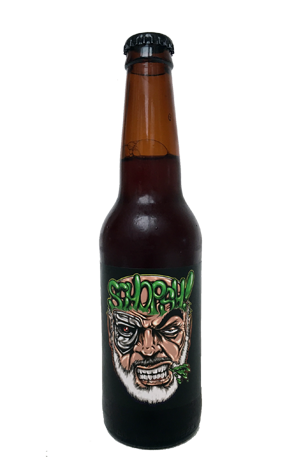 Mark II, which appears to have a Terminator version of Sean Connery on the label, is a little lighter in booze (although at 6.5 percent ABV we wouldn't recommend pouring it on your Weet Bix of a morning) yet still a full-bodied beast. At this early stage in its life, the hops dominate the aroma before the two elements collide in that creamy malt body. The finish is kinda medicinal, kinda herbal, presumably a result of the interaction between peated malt and hops, while the aftermath is very much smoky Scotch ale. So hops then smoke: HopScotch?